Night School When a deep dive into Trump family finances comes up with a pattern of fraud. NIGHT SCHOOL. Kevin Hart, like his frequent costar Dwayne Johnson, lives by hustle. One of the biggest stand-up comics in the world, he came by it honestly, after decades working his way through thankless club dates and TV development deals that went nowhere, until he became the sort of entertainer who holds arenas in thrall with only his voice and a microphone (and occasional pyrotechnics). He has arrived, so maybe he'd take a break for a minute. Instead, he works ceaselessly in television and movies, grinding it out for five or six major projects every year. To his credit, he made the savvy marketing decision years ago to remain accessible, to appear in palatable, PG-13 and below entertainments that willfully refuse to challenge the audience. At all. 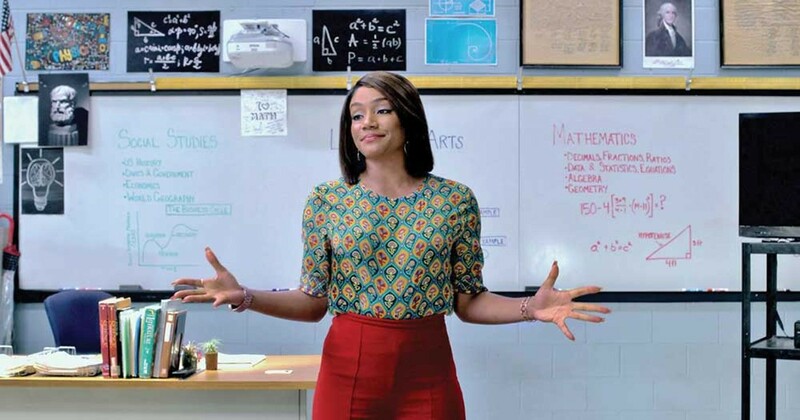 Enter Tiffany Haddish, with whose name I would much rather have opened with, but who is clearly and lamentably second-billed in Night School. In spite of the fact that she is here, as ever, undeniably the star and sole focus of every scene in which she appears. Haddish has only recently come to be embraced by the mainstream, having spent years (a decade-plus) building and maintaining her comic identity in the same hardscrabble boy's club rooms that gave us Hart. She's made guest appearances on too many television shows to count, landed a couple of significant recurring roles (she was a highlight in the excellent but underappreciated The Carmichael Show) and finally broke out with Girl's Trip (2017), directed by Malcolm D. Lee. It would seem that this might be the moment for a project that allows Haddish to speak in her distinct voice, explore ideas her way; Night School is not that project. As glad as I am for its success and that it will help maintain her prominence and viability as a mainstream actor, I wish for more. Night School is very much a Kevin Hart vehicle and a Malcolm D. Lee project. Not that there's anything wrong with that; Hart is a hilarious screen presence and Lee, despite a penchant for sentimentality, has made a few movies that worked even on me: Undercover Brother (2002) is a classic and The Best Man Holiday (2013) had me all full of Christmas cheer. But this is tame, uncomplicated material elevated primarily by its brilliant supporting cast. Teddy Walker (Hart), a high school dropout with hidden dyslexia, has made a life for himself as a barbecue grill salesman. His natural talent for sales and cultivated charisma have made him a perennial employee of the month and the natural choice for succession when the founder retires. But Teddy is also living well beyond his means to impress and retain his sophisticated, more professionally accomplished partner Lisa (Megalyn Echikunwoke). After his efforts blow up (literally), Teddy reluctantly enrolls in night school to earn his GED. Classes, of course, take place at Teddy's former high school, presided over by his nemesis, the megalomaniacal, bat-wielding Stewart (Taram Killam). Said classes are taught by the overworked, no-nonsense, somehow infinitely patient Carrie (Haddish). The story is as unsurprising as its synopsis and, maybe because it took six writers to bring it to the screen, somehow still feels unfocused and rambling. Hart and Haddish are great together, but I would much rather watch them improvise (for almost two hours). Al Madrigal, Romany Malco, Mary Lynn Rajskub and Rob Riggle all give remarkably well-developed, if sadly under-emphasized performances. PG13. 111M. BROADWAY, MILL CREEK. HOLD THE DARK. I'm fond of Jeremy Saulnier's dark cinematic vision. Apparently fascinated — one might say obsessed — with authentic depictions of violence and of the inner dark of lives lived in the forgotten, rural corners of this country; his art speaks my language. With Green Room (2015), he hit his artistic stride: a compact story arc populated by believable characters as backdrop for the elevated mayhem that has become Saulnier's stock in trade. Hold the Dark, adapted from William Giraldi's novel by longtime collaborator Macon Blair, expands the palette and scope of the director's previous work and, while clearly showing progress on a number of fronts, suffers from some marked diminishment of focus and intensity for all its grandeur. Author Russell Core (Jeffrey Wright), who previously hunted and killed a wolf that took a child, responds to a plea for help from the wilds of Northern Alaska. Medora Stone (Riley Keough), left with her young son when her husband enlists to fight the war in Iraq, would have Stone kill the wolf that allegedly killed her young son. This after two other children in her village have been taken. Stone accepts the task, partially as an excuse to reestablish contact with his estranged daughter, now a professor in Anchorage. But as he undertakes the hunt, he comes to question, well, everything about it. And those questions are thrown into harsh relief with the return of Vernon Stone (Alexander Skarsgård) and the maelstrom of vengeful violence attending him. Hold the Dark is magnificent to look at, taking full advantage of the vistas and low light of its locations. The acting is excellent throughout — the model of restraint even as the characters become unhinged. But the story takes on so much, from the mundane to the mystical, that its intensity dissipates as it proceeds. This is significant, controlled work, to be sure, and the work of a genuine cinematic voice, but some of its impact is lost in the snowfall. TV-MA. 125M. NETFLIX. BEETLEJUICE (1988). Michael Keaton as the strange, striped spirit. PG. 132M. MINOR. A STAR IS BORN. Re-re-make with Lady Gaga and a sweaty Bradley Cooper. R. 135M. BROADWAY, FORTUNA, MILL CREEK, MINOR. VENOM. Tom Hardy has a codependent relationship with the toothy Marvel villain. PG13. 112M. BROADWAY, FORTUNA, MILL CREEK, MINOR. HALLOWEEN (1978). Eternal scream queen Jamie Lee Curtis in the original. R. 91M. BROADWAY. BLAZE. Country music biopic about Blaze Foley starring Ben Dickey and Alia Shawkat. R. 129M. MINIPLEX. CRAZY RICH ASIANS. A joyful, glamorous rom-com starring Constance Wu in full movie-star mode and Michelle Yeoh staring us all down. With Henry Golding and Awkwafina. PG13. 120M. FORTUNA. FARENHEIT 11/9. Michael Moore's documentary about how we came to the Trump era and whether there's a way out. R. 125M. MINOR. HELL FEST. Teens visit a Halloween horror house only to find a real slasher roaming the premises. Good luck, final girl! R. 89M. BROADWAY. THE HOUSE WITH A CLOCK IN ITS WALLS. An orphaned boy (Owen Vaccaro) helps his warlock uncle (Jack Black) track down an apocalyptic timepiece. With Cate Blanchett. PG. 104M. BROADWAY, FORTUNA, MILL CREEK. THE NUN. Taissa Farmiga and Demián Bichir investigate creepy goings on for the Vatican in this Conjuring 2 prequel/spinoff. R. 96m. BROADWAY. THE PREDATOR. Director Shane Black's sequel is also its own movie, with solid pacing and a sense of fun that mostly works, despite veering silly now and then. With Sterling K. Brown and Olivia Munn. R. 107M. BROADWAY. A SIMPLE FAVOR. A twisty, stylish date-night noir worth the price of admission for the clothes and to watch Blake Lively and Anna Kendrick interact as vanished femme fatale and homemaking blogger sucked into a mystery. R. 117m. BROADWAY, MILL CREEK. SMALLFOOT. Channing Tatum and James Corden voice an animated feature about a yeti out to prove the existance of a human. PG. 96M. BROADWAY, FORTUNA, MILL CREEK. WHITE BOY RICK. Matthew McConaughey and Richie Merritt star in a true story about a teenager drug dealer who became an informant for the FBI. R. 102m. BROADWAY, MILL CREEK.